Groundwork Jacksonville receives grant for McCoys Creek restoration - The Resident Community News Group, Inc. | The Resident Community News Group, Inc. Visitors at the McCoys Creek Fest check out restoration plans, provide input. Groundwork Jacksonville and the City of Jacksonville are working on a plan to restore McCoys Creek to a natural resource. To share those plans with communities along the creek, Groundwork Jax hosted the McCoys Creek Fest Nov. 10. Shortly after the creekside festival, Groundwork Jacksonville CEO Kay Ehas announced the nonprofit had received a $250,000 grant from the National Fish and Wildlife Foundation and NOAA. The National Coastal Resilience Fund grant was one of 35 awarded in 22 states and Puerto Rico. The free family event drew more than 150 residents and nearby business owners who learned about the history, ecology and plans for restoring McCoys Creek, while enjoying music, lunch and family-friendly activities. The primary goal of the event was to engage the community in conversations about design alternatives and to better understand how residents currently, and/or would like to interact with the creek. Guests were asked to prioritize the amenities, access and green space they want to see included in the plan, like fitness stations, kayak launches, restrooms and fishing docks among other options. The City of Jacksonville has budgeted more than $50 million over the next three years to implement stormwater management, trails and park improvements and has invited Groundwork Jacksonville to provide a plan that integrates natural channel design and green infrastructure to also improve flooding, creek function, water quality, wildlife habitat and recreation. 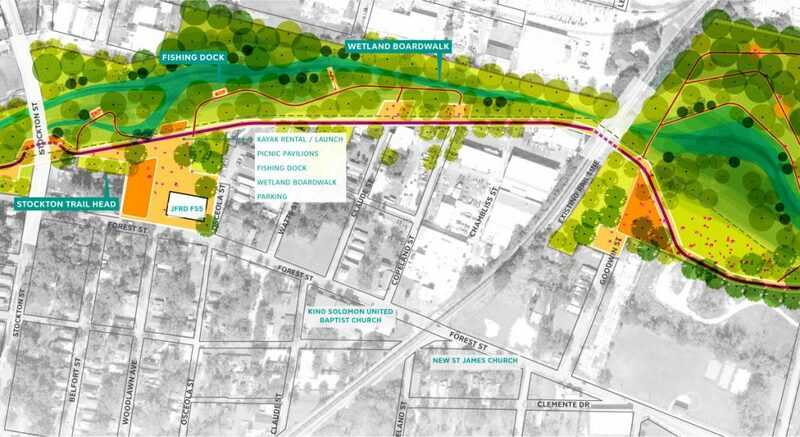 The McCoys Creek Restoration plan, being developed by Wood Environment & Infrastructure Solutions, Inc. in partnership with SCAPE, Landscape Architecture DPC, impacts approximately 142 acres of surrounding land, including Hollybrook Park and Brooklyn Park, and approximately 2.8 miles of creek. The community’s feedback collected during Creek Fest, along with input garnered from Groundwork’s ongoing community outreach with churches, residents and businesses impacted by McCoys Creek, will be incorporated into the final plans presented to the City. The Stockton Trail Head creates a community gathering place and plaza by the Stockton Street bridge, a key connection from the neighborhoods to the north and south. The creek widens within this zone, able to host a kayak launch and a fishing pier. To the east, the Forest Ecological Park balances active and passive recreation needs along the creek.